Hayley is scheduled to appear at the Crystal Cathedral as a guest during the Sunday morning worship service. It will be on May 6, 2007. It's on her CW day-off but once again, she doesn't take the time to rest. Hayley, you are work-alcoholic! More info on The Crystal Cathedral official site. The venue is located at 12141 Lewis St, Garden Grove, California. Thanks for the information, Stephany! In a cathedral ? My vote goes to "Abide with me", of course. The video should be online HERE after broadcast. TV listings are available on the "Hour of Power" website. That's great! Thank you for the information, Stephany. If I remember correctly, I think it is the third time that Hayley sings in this cathedral. THANKS for this Stephany! But for me, the service will air at 9 AM. In the USA, use the Hour of Power website to learn when it will air on your area. For whatever reason, the guest list on the show as it is now playing in St Louis at least) is not the one specified above. The same thing appears to be true with the Lifetime Channel. Jon, the recorded show with Hayley is expected to air next week as it is not retransmitted live. The video clips will be available HERE. My name is Geralynn and I am new to the Hayley Westenra International Forum. I just had to share with you my incredible experience which began last night at the Greek Theater. I was fortunate to have been sitting in the 2nd row from the stage, as you can imagine, the view was amazing. I was really looking forward to seeing Hayley in concert for the first time and believe me she more than exceeded my expectations. Her solo numbers were Dulaman (Her Gaelic was perfect by the way) Scarborough Fair and Danny Boy. During Dulaman, you could tell she was really enjoying herself It just amazes me how Hayley can sing any song and make you love it all the more. The concert is one I will always remember . I will also be attending the concert at the Long Beach Terrace Theater on Tuesday night with my cousin. She is a big fan of C. W. and Hayley also. I really want to thank you for letting us know about Hayley appearing at the Crystal Cathedral last night. If it were not for you , I would not have had the opportunity to see her this morning. As it turns out, I walked in the Cathedral as she was rehearsing "Abide With Me". Let me tell you, she is even more beautiful in person and she sang so amazingly. I couldn't wait until she actually performed during the service. (to be continued). Well, needless to say, she did a wonderful job and got a standing ovation which she richly deserved. Hayley told the congregation that she just returned from visiting her family in New Zealand and she ireally enjoyed touring with Celtic Woman. After the service, Hayley was signing her new C.D. "Celtic Treasure" in the bookstore and I was lucky enough to meet her. She is so sweet and genuine and I am just in awe of her. I can see why her family is so proud. Because I was so caught up in the moment , I had forgotten that I had a gift for her. As they were wisking her away for the next service, I was able to present her with a Celtic cross from Ireland. She was so sweet and appreciative and it made it all worthwhile. In closing, I just want to thank you for letting me share my experience with you, and Hayley, thank you so much for being the wonderful girl that you are and for the many ways you have touched my life. You truly are one in a million! If you have had time to look around this site, you will see that as a Hayley fan, you are in very good company . I very much look forward to your future posts. It's not often we get a new member on the forum that has just met our precious Hayley!! Your report from the Crystal Cathedral is wonderful and to hear that she sang "Abide With Me" (I thought she would) my all time favorite hymm WOW!! Have you come across the expression "Hayleywowed" yet? Most of us have been and relish in it. From your posts, I can tell you have been although you perhaps don't realise it yet!! Enjoy your time with us and long may it continue. We are a happy bunch of people and you are most welcome to be a part of our great "family"
I look forward to your future posts and reports. 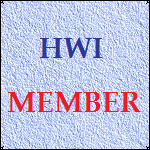 A warm welcome to the HWI forum also. We have many American members and contributors so it's good to have another from California. Your Hayley "experience" sounded wonderful and like many of us, meeting Hayley in person is never to be forgotten.